The Ryan dress is so cute & fun! Features include a round neckline, short sleeves & a gathered elastic waist with a stylish zipper detail on the bodice. The zipper is functional, making this dress nursing friendly! 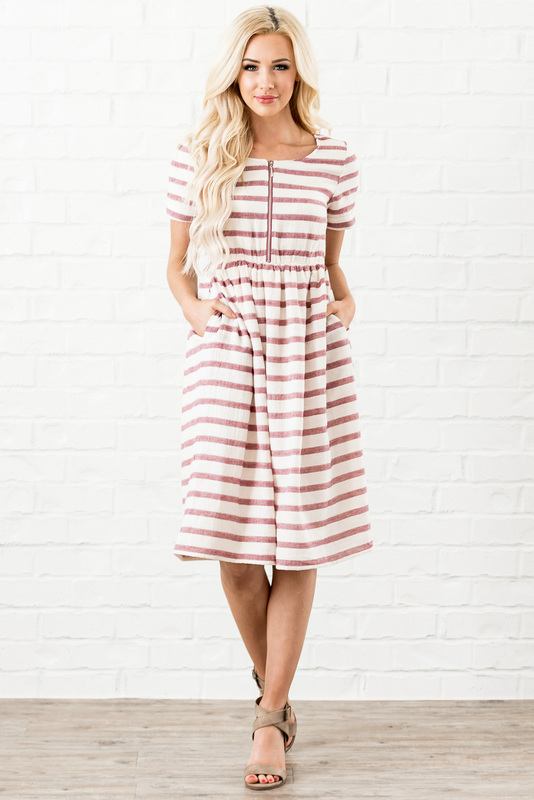 The pretty raspberry pink & white striped pattern is classic with a trendy twist. The linen blend fabric is light and breezy, making it cool and comfortable during warm weather. Dress is fully lined including the sleeves & has pockets! Perfect for casual, everyday wear, but also works great for date night or going to church. Lengths: XS-S 38.5", M-L 39", XL-2XL 39.5"